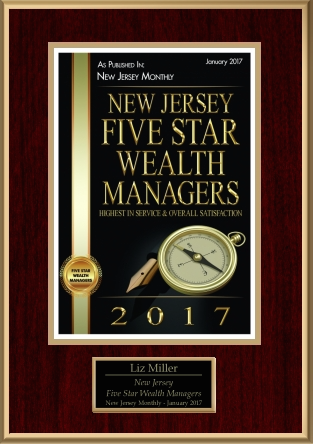 We are excited to share that Liz has been honored by Five Star Professional with the 2017 Five Star Wealth Manager Award for exceptional client satisfaction and service. Liz was recognized for the success of the firm’s goal-oriented approach to providing comprehensive and personalized financial solutions. Administered by Crescendo Business Services, LLC, the Five Star Professional Award identifies and promotes professional excellence. Wealth Manager award winners are chosen based on an in-depth research process incorporating peer and firm feedback with objective criteria such as client retention rates, client assets administered, industry experience and regulatory and complaint history. The wealth managers in the state who were honored for their demonstrated excellence were showcased in New Jersey Monthly’s January issue.